Applications for LE Brazil are now closed! The program Year 2019 will mark LE Brazil’s seventh year in operation and the community of Valinhos, São Paulo could not be more excited to welcome a new group of volunteers! Volunteers will begin the experience in Campinas, São Paulo where we will complete a 3-day orientation program. This time is structured to provide you with the tools necessary to succeed in your new classroom, and you will leave with an arsenal of dynamic and engaging lesson plans under your belt. Volunteers will also gain some familiarity with the language and culture and learn valuable tools to succeed in interactions with their host families and other members of the host community. Classes will run five days per week for four weeks. Two days before classes begin, volunteers will meet their host families at the introductory BBQ and be welcomed into their homes. Volunteers will also receive detailed information about their school schedules and the process of getting to their schools. Volunteers should be prepared to take the bus to and from school each day. Midpoint Break will take place during the weekend of the third week. This will be an opportunity for volunteers to debrief and reflect on the successes and struggles they have faced, and how to finish the program strong. Volunteers will also have the opportunity to unwind after a couple of weeks of teaching and bond further with they fellow volunteers. Programming ends on Sunday, June 30th, when the volunteers and host families will celebrate the end of the program at the Closing Ceremony and spend one last night together. Following the end of the program, volunteers are free to return home or stay in the country to do some traveling. Is compassionate and enthusiastic. Teaching experience is not required, but a genuine desire to facilitate children’s learning is! Is flexible and ready for adventure. Living and working in a foreign country means that you must know how to react to events as they happen and handle challenges with maturity, wisdom, and a sense of adventure. Seeks to be both a leader and a teacher. In the class, you are the show and there is no understudy! There is no co-teaching in the Brazil program, and volunteers should note that they will have a classroom to themselves. Is out going and has a passion for cultural exchange. Brazilians are friendly and outgoing people who enjoy socializing. You will be completely immersed in the Brazilian culture and volunteers are encouraged to learn and absorb as much of it as they want! Don’t forget that it is also okay to share a bit about where you come from! Embraces creativity. The students you will work with are used to sitting in desks for English instruction out of workbooks. You need to be willing to get the students up and moving, think of ways to instruct English without relying on direct translation and engage a variety of different groups of different ages. Even if a volunteer has knowledge of the Portuguese language (which is not required), it is expected and required that the sole form of communication in the classroom will be in English. Valinhos is a small city located in Southeastern Brazil, about 90 km from the state capital of São Paulo. It is a small city with a population of roughly 120 thousand people. Famous for its purple fig cultivation, Valinhos also houses a fair amount of modern industry, the most prominent of which is Unilever. Many of your host parents will be part of the area’s growing middle class, small business owners, or industrial sector workers. For this reason, you can expect modern and comfortable living conditions - including, for example, TV, Internet, and hot water - but that may not necessarily fully equate to Western standards. As it will be winter during our program, expect the weather to include warm days in the 70 degrees F and colder nights in the 50 degrees F or lower. Rain will be minimal as Valinhos resides in the subtropical region of the country and it will be the dry season. Each volunteer will be hosted in a different neighborhood of the city where they will live, teach, and become part of the community life. Host family settings range from more rural chácaras (country homes) to apartments in the city center. All will have access to a strong bus system that will allow volunteers to travel to and from their homes with ease. Because volunteers live together in the same city, a factor unique to LE Brazil, they should expect meetings and get-togethers with other LE participates, from lesson planning groups to social excursions with host families. Perhaps the best selling point for the LE Brazil program is the Valinhos community. Brazilian culture is one that emphasizes embracing, loving, caring, socializing, and, perhaps more than anything, feeding. No matter their financial means, host families will go out of their way to make you feel welcome, loved, and full. Furthermore, because you will be in Brazil during the season of Festa Junina, an annual Brazilian celebration of rural life that features traditional foods, clothes, and dancing, you should be ready for more than one weekend of eating and dancing with your host family and students! Your primary teaching assignment will be at a public middle school in the municipality of Valinhos. Due to a combination of large class sizes and limited public funding, students attend classes during one of three five-hour sessions: morning, afternoon, and evening. Working within this educational context, volunteers will hold classes for middle schoolers either before or after school has ended for the day, and will have access to a classroom or community room in the school. What is available in each classroom, however, varies greatly and is very much dependent on the location of the school; those working in the urban center, for example, may have more materials in the schools while those in more rural communities may have little more than desks. An outdoor space is available at most of the schools, and volunteers are encouraged to make use of any soccer courts, parks, or fields in the area to create fun and engaging lessons for their students. Students will usually have little or no previous knowledge of English, although some groups may have more advanced skills. Because programming will take place during the Brazilian academic year, volunteers will have the opportunity to get a glimpse of the inner workings of the Valinhos public education system. Many will end up providing classroom support for their school’s English teacher one or two days per week, leading games and acting as a conversation partner in addition to holding their own classes each day. Volunteers can also expect to have significant interaction with other teachers outside of the classroom—hanging out in the teachers’ lounge in between classes, for example—thus providing additional opportunities to bond and engage in more cross-cultural experiences. Some Awesome Things About Brazil! English is seen by many Brazilians as a modern economic necessity and a tool for social advancement and additionally popular due to the influence of American culture in Brazil. Don’t be surprised when your students flock you with questions about English and the U.S. or if you become the school’s “pop star” when you begin speaking in English! Brazilians are extremely friendly, outgoing individuals who will want to get to know you everything about you. The nearby city of Campinas has various shopping malls, including one of the largest in the Americas. From Valinhos, volunteers can, after their program, travel to Campinas, São Paulo city, and the state’s less known but nonetheless amazing coastline. MEET YOUR PROGRAM DIRECTOR, FELIPE! 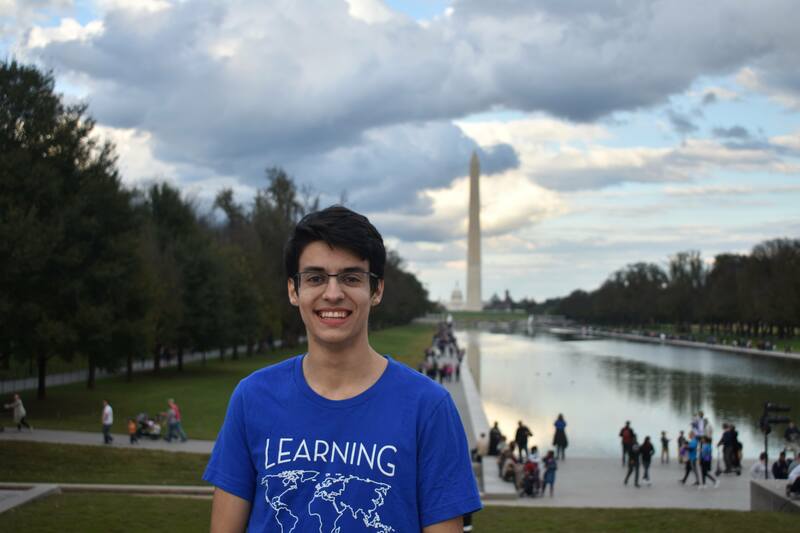 Felipe is a sophomore majoring in International Politics at Georgetown University in Washington, D.C. He is originally from Campinas, Brazil but has also lived in Amsterdam, Houston, and New Orleans. Having spent most of his life away from home, Felipe is excited to return again and help give back to his community. As a volunteer with LE Brazil 2018, he loved teaching and working with LE to advance its mission. Felipe is eager and ready to make PY2019 the best one yet! Interested applicants can contact Felipe at brazil@learningenterprises.org!